You should wear statement lipsticks more often... It suits you very well! I love this photo :) that color looks absolutely stunning on you! I have never tried any Jane Iredale before, but heard LisaLisaD1 talk about the line a lot (I have become addicted to her Friday Hauls...!) Currently my favorite statement lip is Tom Ford's Black Orchid (that we bought together, I cannot believe that was so long ago!) or MAC Rebel. Both gorgeous berry tones for the fall! I am trying Urban Decay's new lipstick in Manic. I really like it so far, I need some of the other colors. This looks great on you, Laura! I find I'm most self-conscious with bright lippies if the formulas are really drying... then I feel like my lips look all flaky yet I am drawing all this attention to them. Doesn't seem to be a problem with this Jane Iredale one though! I'd just love it .. if Jane Iredale products were available in stores. Such a lovely colour! Suits you so much. I'd love to wear a statement lipstick but struggle to find a shade that actually suits me. You're beautiful! I always love you in bright lips! This is a gorgeous lip colour and it really suits you! I love that colour. I have a wide collection of red lipsticks. Wow, that colour is stunning! That colour really suits you. I completely agree about the bright lip complex, I get ridiculously self-conscious when wearing them! You look gorgeous! I find it's getting the tone correct that's difficult; picking between orange undertones or blue undertones. I can only wear a red lippy with blue undertones. That shade really suits you. I'm more myself in a bright coloured lip, god knows why because they're so hard work to wear and make sure you don't have it all over your face within minutes! I'll have to look into the Jane Iredale range as it's not a brand I'm too familiar with! I never really hear of this brand but this looks lovely! 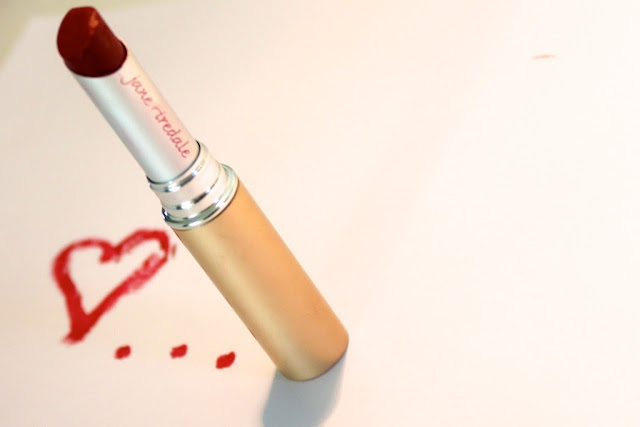 This shade looks gorgeous on you! I love a statement lip as well but find them difficult to rock in every-day life. I do really like Rimmel by Kate Moss #110 for a matte red. I love Jane Iredale make-up, their powders are amazing! This is a keeper. Colors like this look fantastic on brunettes! I love a classic red lip. You should rock the red lips more often Laura, you look fabulous! This colour really suits you! The closest I get to a bold lip at the moment is a Revlon balm stain, I love the look of colour but I chicken out about the stares I get walking down the street with them on. You really suit them though so should definitely wear them more. I love your posts about lip products! They always inspire me to be brave with lipcolor! I love looking at bright and bold lipsticks, but get a little shy about wearing them in public. Laura, have you tried The Body Shop's Colour Crush lipstick yet? It's staying power is OUTSTANDING... as in, it WOULD survive a hearty meal. When the lipstick layer does, finally, wear off your lips are stained for the rest of the day (and not just around the edges, which is the worst). Passionate Pink/No. 205 is definitely self-conciousness inducing, but totally gorgeous if you dare. I really love this lipstick! Never heard of this brand, looks lovely though! 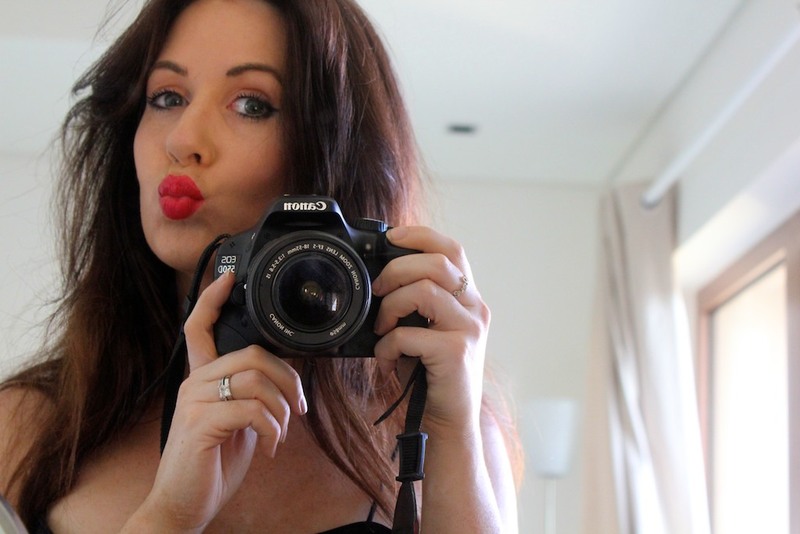 I LOVE red lips but haven't taken the brave step of wearing one out of the house yet! MAC ruby woo is on my 'to buy' list so wish me luck! What luck that I stumbled on to this blog post - I know the lipstick was the star of this post but I've been looking for a lighter version of NARS Sin. I love the color but on my pale complexion it is a bit much even applying with a duo fiber brush. Will check out The Secret's Out the next time I'm in Sephora. The lipstick is stunning on you! Hi Laura, I'm so glad to have found your blog, because I've been missing your youtube tutorials for years now! This lip color is stunning on you. It's hard for me to tell - is this more of a warm or a cool-toned color? My impulse is to run and get it, but I do have fairly light skin with some red undertones, so I know that a warm-toned lip will be a disappointment. Hello my friend! I would like to tell you that this write-up is awesome, great written and include almost all important info. I recently came to know about www.avanaaustralia.com, their Mineral Makeup are very effective.